Wireless signals suffer sometimes in various parts of your house, and you’re pretty sure it’s just normal. You deal with it and know if you go to that corner of your home, you’re just not going to have a good signal. What is that didn’t have to be the way of things anymore? It’s true. Signal degradation happens due to the constructs of your home, but it is now possible to reduce the interference that causes the signal to go weak. Having a solid signal all over your home may feel like an intangible dream, but wireless mesh makes it possible with today’s technology. It even works in larger homes near flawlessly. You may be wondering, though, what exactly is wireless mesh? Every now and again there are huge strides forward in technology, and the most recent one is wireless mesh networking. It’s more than just routers with a spin. The technology actually improves the wireless signal available in your very own house. Imagine a net and the way the fibers criss-cross to cover something. Wireless mesh works the same way by casting a virtual netting over your entire house. These wireless mesh networks are also extremely simple to configure compared to more traditional router setups. Once you finish setting them up, they’re ready to continue on their own without any intervention from you. Mesh networks effectively solve one of the more significant problems that have been around for a while concerning wireless networks. That problem has been to provide coverage to areas that do not have good signals. The dead places that you come across or that wireless signal that seems to fade in and out can be fixed and improved by using wireless mesh networking. Wireless mesh networks have several bases also referred to as nodes, beacons, or units. Each of these bases extends the overall size of the network. They all exchange data regularly between nodes and are all equally aware of any other nodes on the network. One of the biggest differences between traditional router networks and wireless mesh networks is the way data moves across them. Traditional router networks transmit data while wireless mesh networks move data. The difference in functionality creates a higher throughput compared to conventional networks. Mesh routers and nodes also have a different number of bands – some are single, duel, or tri-band by design. Having more bands means more improved functionality. The number of bands that Eero has, three, allows for better data carry without resulting in a congested channel. This is such a new technology for consumers that there is a lot to think about in terms of wireless mesh. One of the more significant considerations needs to be about the way the different mesh networks communicate with each other. Each manufacturer has a separate proprietary protocol that the different nodes communicate with on the mesh network. The reason for this is because there is no set standard unlike the pre-existing 802.11n that most network connection uses. To illustrate what is happening, you can’t take an Orbi and mix it into a mesh network comprised of Eero beacons. It’s very different from current tech because you can mix brands and they’ll all communicate with each other. Belkin, D-Link, and all the others out there follow the same industry standard in their traditional wireless connections. available if a company isn’t there anymore. Security flaws would be waiting to be exploited because no one would be there to ensure updates arrived promptly. You need to take the time to think about whether or not you’re okay with the possibility of losing the future assistance if any of these companies ever disappeared. It’s a real possibility because so many of the companies turning out mesh technology are startups and it’s common for startups to not last for a long time. Established companies like Netgear and Google, though, probably have a longer lifespan, but at the same time, if they’re not selling the product well enough, they’ll remove them from the shelves, too. 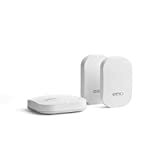 Eero is a startup and revolutionary in consumer mesh tech. Their mesh tech is in the second generation of their product. The router and nodes contain a tri-band mesh system. One band is solely for communication between the different nodes. The dedicated band keeps the nodes talking to each other without congesting the other bands to improve overall throughput. The beacons are small, nice to look at, and have a polished, low-profile size. If you’re into minimalism, this would fit in well with the rest of your home. With Eero, you get extensive coverage across your home with at least two beacons. You can add more beacons if you want to and they will all connect seamlessly. Eero also ensures a fantastical efficient network because of the way the bands are configured. Coverage is exceptional across larger distances, too. Even adding a new beacon is easy. Your app will send you a notification once you plug it in, and then you update it if it tells you it needs an update. Setup is so easy a child can probably do it. Just remember, you’ll need to download the app to get it done, so download it first before you get started. You can find it on Google Play or the Apple Store. The user-friendly app takes you through from start to finish to get you connected quickly, too. In the event that you’re not familiar with this kind of technology, you can still follow the instructions relatively easily. You’ll also notice that there are three pieces - a base unit in addition to the two other beacons. Only the base unit has an ethernet port for wired connectivity, so keep that in mind when you’re going through your setup process. If you want other hard-wired connections, you’re going to need more base units. The Eero app is easy to navigate, too. You can check everything you want inside the app and see what is happening in real-time in your network. Information that you’ll see includes device usage, diagnostics, and the ability to shut down the internet connectivity if you needed to do so. In other words, if your kid’s friends have outstayed their welcome because they lost track of time playing online video games, you can temporarily disable the network long enough to get them all out of the house. The reality is, though, the app has excellent usability and intuitive functionality. You’ll love working with the app because it’s just that easy. Eero has rolling software updates on a regular basis with each update providing all of the latest patches, security additions, and bug fixes. If you want to, you can also manually update the network via the app. Upon installing your network, you’ll get a notification asking if you’d like to install updates. Tap the button on the app, and just wait for the updates to start. It’s okay if you don’t get a notice because it just means that your Eero is already fully updated. Make sure you have the latest app version, and everything else will go smoothly for you. The Eero was one of three units that were tested by Business Insider, and it had outstanding performance. The primary router delivered a download speed of over 100Mbps along with an upload speed of 35Mbps. When the connectivity over at one of the beacons was tested, the download speed was consistent with the primary router at 100Mbps or more, and the upload speed stayed at 35Mbps. 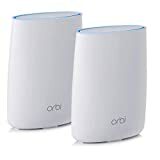 You might not be crazy about the way Orbi looks, though, because it isn’t the best looking piece of equipment out there. Plus, they’re really big comparatively speaking, and you won’t be able to tuck it away into some unobtrusive corner somewhere. From another perspective, Orbi is manufactured by Netgear, which is an established company that likely isn’t going anywhere in the near future. This has the potential to be a significant benefit over competitors because you know they’ll probably be around for a long time to come. It is a tri-band system with one of the bands dedicated to the unit communication so as not to cause congestion in the rest of the network. It’s the core reason why this mesh system works so effectively. Another option that is offered by Orbi is an outdoor satellite that makes it possible to extend your internet coverage outside. This is a fantastic offering that parks and outdoor events could absolutely take advantage of. On the downside, the Orbi is expensive, and the three-pack runs around $ with extra satellite units that are around $ each. All Power Moves did a full set up on Orbi, and their reports were nothing spectacular. The setup was pretty easy enough with the app. It’s a lot easier with the web browser that you’re used to seeing when you log into a Netgear device from your computer. The mesh system that the Orbi creates also has to be stacked in a specific way to make sure that the base unit communicates properly with the other satellite units. Options on the Orbi during setup are far more complicated than the Eero or even Google Wifi because there are so many. There are advanced options like QoS as well as forwarding. A technical guru may like these available options, but it might be too much for the average person that just wants to plug the thing in and go. The Orbi app is not as user-friendly as the Eero app when you get a chance to compare the two. You can’t prioritize devices or put in much in the way of parental controls. Really, you’re better off getting into your Orbi by way of your web browser to be able to access the entire suite because the app is pretty limiting. When it comes to overall performance, Orbi knocked it out of the park. It is fast no matter where you are in your house because two units will cover up to 5,000 square feet which covers larger homes quite effectively. It was also one of the mesh systems that was tested by Business Insider and download speeds. It delivered download speeds of over 100Mbps and upload speeds averaging 35Mbps. It was right on par with the Eero, too. Now that you’ve had the chance to get to know a little more about the Eero and the Orbi mesh networks, here’s a quick breakdown into the pros of each one. Expect nothing but excellent performance with the Eero. Excellent download and upload speed at both the primary router and the satellite beacons. The low-profile design of the beacons and the main unit are compact, too. The app is user-friendly as well as easy to work with during set up and updating as well. Updates happen automatically without intervention, but you also can manually update if you want to. It is more expensive between the two. Limited by two ethernet ports on the main unit. Eero uses proprietary protocols, so you can’t mix different models of wireless mesh network devices with it. Eero is a startup company, and startups don’t always succeed. This means you may or may not be able to get support later. The Orbi delivers excellent performance. Updates are also set to roll out regularly without you needing to prompt anything. There are several ethernet ports on the main unit and on the satellite. Coverage is fantastic with each unit covering at least around 2,000 square feet. The Orbi is massive compared to a mesh system like the Eero. The Orbi is expensive compared to other consumer mesh systems. Available options are incredibly complex and not as easy to setup as the Eero. The app needs some work. Knowing which one to buy between the Eero vs Orbi is going to be dependent on the end user. If you want more options along with excellent connectivity, then the Orbi is the way to go. Orbi is also less expensive than the Eero, and it comes with three units including the router compared to the Eero that only comes with two. If you’re not as technically savvy and you want something that is easy to set up, then the Eero needs to be the choice for you, even if it does cost a bit more. Consider the longevity of the company, too, and decide whether or not that makes a difference to you for long-term purposes. Whichever one you choose, though, you’ll know that your connectivity will consistently deliver fantastic speeds.